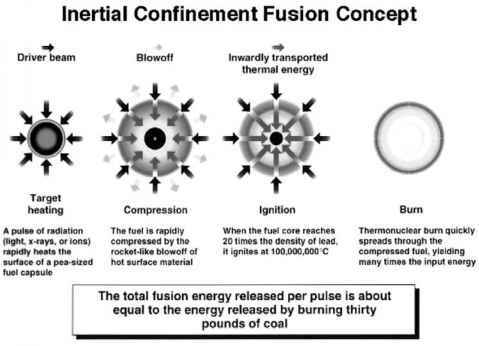 Historically, this strategy for confining fusion fuel was proposed about 10 years after the Matterhorn fusion project of the 1950s in [Basov and Krokhin, 1964] and [Dawson, 1964]. Two factors contributed to start work in inertial confinement: the first was the realization that MCF presented more difficult problems than initially thought; the second was the availability of pulsed lasers in the GW class. The second factor especially suggested the possibility of bypassing the MCF need of large continuous heating power to ignite. The Lawson condition for ignition, equation (8.17), is a steady-state energy balance linking particle density n to confinement time t. Density in MCF reactors cannot be very high, because otherwise the plasma becomes collisional and the magnetic field ineffective; inevitably, the only way to compensate for low n is to heat the plasma for a long time t. During this time plasma instabilities, radiation losses and other factors tend to reduce substantially the amount of heating that the plasma should theoretically absorb. On the n, t plane the MCF strategy occupies the rightmost end of the hyperbola. 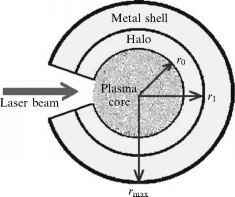 In inertial confinement fusion these problems may be bypassed by striking a solid fuel pellet (not a fuel plasma) with a very high power laser. The pellet could be made, for instance, of frozen D-T fuel encapsulated in a metal case. In fact, inertial confinement fusion (ICF) envisaged a whole group of lasers (e.g., the Los Alamos "SHIVA" laser assembly, or that at the National Ignition Facility at the Lawrence Livermore National Laboratory, LLNL), each simultaneously beaming a power pulse to a single fuel pellet. At the National Ignition Facility energy up to 1.8 MJ may be deposited within 4 x 10~9s, corresponding to an instantaneous power of 450 TW (1TW = 103GW = 106 MW). At such energy deposition the outside surface of the pellet ablates, creating a spherically symmetric high-speed jet that compresses the pellet: the pellet implodes [Daiber et al., 1966], and reaches the density required for fusion ignition on a timescale of order 10~9s, or about 109 shorter than the 1 s confinement time typical of current tokamak. Accordingly, there is hardly any time for plasma instabilities and other unwanted effects to develop before ignition. So, unlike MCF, ICF heating is totally unsteady, but if one still wanted to have a mental picture of this strategy, the nr scaling of equation (8.18) would indicate it occupies the leftmost end of the hyperbola. A notional scheme of ICF is shown in Figure 8.16. Some typical features of pulsed lasers are reported in [Huba, 2002, p. 50]. Figure 8.16. Schematic operation of inertial confinement fusion (http://hif.lbl.gov/tutorial/ tutorial.html). Figure 8.17. 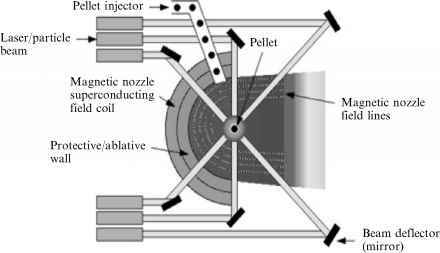 Conceptual operation of an inertial confinement fusion reactor rocket with its magnetic nozzle. depend on mass fused, that is, on pellet injection repetition rate. The nozzle will probably be a magnetic nozzle, where an external field B not only guides the collisional plasma, but also limits the heat transfered from the plasma to the nozzle walls. Figure 8.17 shows schematically how to realize ICF using multiple laser beams. To predict ignition conditions in ICF reactors the Lawson's criterion (a steady-state power budget) cannot be applied, since the ICF process is deliberately made unsteady. The correct criterion, as in all unsteady processes, must be based on characteristic times. In fact [Kammash, 1995, p. 17], the ignition constraints of ICF can be reduced to their simplest terms by introducing just two characteristic times, td = RIcs, the destruction time of a pellet of radius R by pressure waves generated by the laser pulse in the fuel plasma, traveling at plasma sound speed, cs; and the time, tb, for fuel "burning" (that is, fusing). The burning time, tb, may be estimated by imposing that the burning rate of plasma scales (as in all collision kinetics processes) as (p/mi)/tb, that is as concentration (density divided by particles mass) per unit time. This rate of burn must be proportional to the collisonal cross-section among plasma particles, o\ Here p is the plasma density and mi is the mass of the plasma ion, He ++, T+, D + or H+). In essence, td is a residence or travel time, and tb is a kinetic time. Note that this criterion depends on the system of units one uses: it is not cast in terms of numbers such as Mach or Reynolds. The physical meaning of this criterion is the following: for fusion to occur the energy deposited on the fuel pellet must be "high" enough. High energy will compress the pellet and make it denser. However, to fuse it, the density that counts is that of the thinner surface layer where energy is deposited, not the volumetric density. So, the smaller the pellet, the higher the density p to achieve. One may think then that using large enough pellets fusion will start without any problem. In fact, raising R does not automatically ensure the right density! Raising R means, in fact, that more energy must be deposited to achieve the same energy per unit area. So, the ICF ignition condition hints obliquely to a key issue, that of the ICF energy budget. The net energy available from ICF will be that released by fusion minus that used up by the laser beam(s) to compress the pellet. Their ratio, Q, is the "gain" of ICF, and a major subject of investigation in fusion physics. Comparing the two different breakeven/ignition criteria, that is, for MCF and for imploding ICF, the second appears ten times "harder" to meet. This is not completely true, however, since MCF systems barely meeting the Lawson criterion burn less fuel than ICF systems under these same critical conditions. The real advantage of ICF over MCF is actually that ICF does not need externally applied magnetic confinement. This makes it very attractive for propulsion, because it does away with large-B magnets, superconducting or not, and their associated mass and complexity issues. On the other hand, ICF propulsion needs powerful lasers or particle beams. Although these components tend to be massive, ICF should be considered as an alternative to MCF-based propulsion systems. Figure 8.18. Sketch of MICF pellet. generated by the laser pulse forms its own magnetic field B. The B field is generated in a time of the order of nanoseconds: accordingly, the Maxwell equations predict B will be so intense as to confine plasma. Besides this timescale, the other key difference with MCF is that the spatial confinement scale is much smaller, since it is of the order of the pellet size (a few millimeters). Impulsive confinement prevents the plasma just forming from bursting immediately through the pellet case. This fusion strategy has been dubbed MICF (see Figure 8.18). Penning trap could store ~10~13 kg of antimatter. The potential energy released by annihilation would be of order 104 J, since a = 1 (see Section 7.3). At the moment Penning traps are heavy (^50 kg), but storing technology is also in its infancy and may improve. The theoretical performance of antimatter rockets would be maximized, since the energy/unit mass in any annihilation process is exactly c2, but the pions produced possess energy in the 250 MeV range (i.e., about 0.94c). An example of ideal performance analysis of antimatter propulsion for interstellar and precursor missions can be found in [Schmidt et al., 1999]. The chart in fig. 1 lists the mass of antiprotons needed as a function of spacecraft mass and engine technology. In fact, annihilation is simply a way of converting potential into kinetic energy. Similarly to what was done in the past for fission engines, matter-antimatter annihilation may be made to occur in a solid or gas core, or even conceived to accelerate only the annihilation products, without any addition of inert matter. Consumption of antimatter is minimized when using it as a catalyst for more conventional fusion reactions (e.g., the reaction D +3 He). Thus, depending on what technology is chosen, the mass of antimatter varies by orders of magnitude, from 10 ~9 g when used as a catalyst, to 109 when only annihilation products are ejected as propellant. For instance, in the former case and using a solid core to absorb the energy released and heat He gas, the mass of antiprotons necessary for a 100 kg probe to reach 103 AU in the Oort Cloud depends on the AV (trip time) planned, and for a 50-year mission is of order 10 mg to 100 mg (the A V is of order 103 km/s in this case). However, for the same 50-year mission, a 100-ton spacecraft (presumably capable of hosting a crew) would require 100 kg of antiprotons. These numbers are worth keeping in mind when discussing antimatter propulsion. As with all high-Isp propulsion systems, the Isp vs. thrust tradeoff means that the thrust enabling fast space travel must be paid for in terms of power (in this case, the antimass consumption rate). Adding inert mass to the annihilation process is the standard way around this issue: however, in this case the problem is complicated by the (short) timescale of p-p~ kinetics. This question is part of an assessment of antimatter propulsion that has been compared with more "conventional" fusion propulsion concepts [Borowski, 1987]. The results of this comparison indicated that advanced ICF, using, for instance, D + 3He, or catalyzed D + D fusion, is preferable to annihilation. Advanced catalyzed fusion is still a conceptual area of research that has as a goal the lowering of fusion kinetics ignition temperature, just as in conventional chemistry. For D + D or D + T reactions the "catalyst" consists of muon particles (muons). Combined with a sufficiently high target density, muons increase the rate of fusion events (e.g., see [Takahashi and Yu, 1998]). In turn, muons are produced from pion decay when p and p~ annihilate: thus, a truly advanced, if speculative, fusion concept should consider both ICF and antimatter together (see [Gaidos et al., 1998]). Going back to the question of how to initiate kinetics, besides lasers, fusion microexplosions have also been proposed and theoretically investigated. The basic idea is still the so-called "ignition train" implemented when large quantities of explosive (or reactants) must be detonated: small explosions trigger bigger ones, and so on, until the entire charge can react. This is standard operational procedure in any large solid-rocket motor. 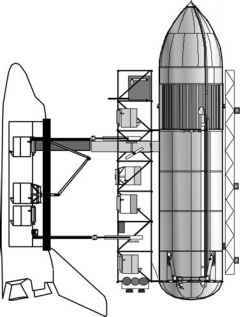 For instance, in the Shuttle's two boosters the ignition train uses three rockets of increasing size to start combustion inside the solid-propellant grain port. In fusion ignition, D-T fuel pellets may trigger larger DD and eventually D-3He, or other convenient fusion reactions. Although this is a simple concept, control of such processes in a propulsion device may be tricky [Shmatov, 2000, 2004]. In this context, p-p— may be the "simplest" small reaction capable of starting the ignition train in an ICF rocket engine [Shmatov, 2005]. Note that all the ICF ideas and proposals discussed range from the theoretical to the speculative, passing through the conceptual, and this should be kept in mind when considering practical propulsion. An extreme example of a conceptual ICF propulsion study is Project Daedalus [Bond et al., 1978]. This study envisaged detonating D + 3He pellets by electron beams (not lasers) inside a thrust chamber, at the rate of 250 s—1. The Daedalus spacecraft was assumed to accelerate over a period of four years to its cruise speed (36,000 km/s, or 0.071c). The objective was to reach Barnard's Star, 5.9 light-years from the Sun, within the useful 50-year life of a human being. This spacecraft was a two-stage vehicle with a 54,000-ton initial mass, equipped with optical and radio telescopes to investigate Barnard's Star from afar, since this mission did not include capturing the orbit of Barnard's Planet which at that time was believed to exist. To date, this remains the most detailed study of a manned interstellar mission using fusion propulsion (see also Section 8.12).